There’s a good chance that, if you’ve made it to this article through Google, you’re looking for some conflict resolution. You had a spat with a coworker and are now looking for ways to either get the conflict to go away or to “win” whatever dispute you might be having. It’s okay to have these problems, or at least understandable: 85 percent of all employees deal with conflicts in the workplace, and 36 percent deal with them frequently. And since you’re online looking for ways to address the problem, that means you’re giving the issue some time to cool, so you’re already making progress! If you’re looking for advice on working through the conflict, preventing future problems, and turning a dispute into something good for your organization, you’re in luck. If you’re looking to win the argument or “come out on top,” this is not the place to look (hint: it’s not a good idea to do this). The best way to avoid conflicts in the first place is to make sure they never happen. 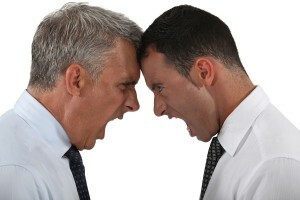 Employees agree: 54 percent of them say managers should deal with conflicts before they arise. But how should they go about doing that? It’s not the cheapest, fastest solution, but 95 percent of employees that have gone through conflict resolution training say it’s a big help — but 60 percent of employees in general don’t get this kind of training. If your workplace feels like a minefield of conflicts as soon as you walk in, this is the best place to start. The Management Study Guide offers a few other suggestions: keep your emotions in check, don’t aim to win fights (again, this is important! ), and assess whether or not it’s even worth having the conflict in the first place. You’re free to let some of the more minor conflicts go, as long as letting it slide won’t impede progress. There are some cases where you shouldn’t let it go, however. According to an infographic from Abilene Christian University, 10 percent of workers have seen conflict lead to a project failure, and 25 percent have seen it lead to sickness and absenteeism. If you can’t afford to let the conflict go, we suggest introducing mediation of some kind, as it can help improve relationships between employees, retain valuable workers, and lead to fewer formal grievances against employees and your company. If you can’t prevent a conflict from happening, that doesn’t mean it’s time to throw reason out the window. There are good and bad ways to discuss a conflict with employees and coworkers. Twenty-seven percent of employees experience personal insults or attacks during conflicts, and this doesn’t help anyone. If your conflict is a result of two different perspectives on solving a problem, understand that the goal of the conflict should be to find a solution — no matter whose idea the solution is. A quick way to let everyone know you’re working towards a solution is to use “I statements” instead of “you statements.” Instead of saying, “You don’t know what you’re talking about,” try something along the lines of, “I have experience with this kind of issue.” Using “you” in a statement makes it seem as though the other person is at fault, while using “I” makes it clear that you’re only out to solve the problem, not play the blame game. To that end, always keep flexibility in mind: the solution that arises from the conflict might not be the one you had in mind at the start. Just because you can avoid conflict, doesn’t mean you should. Even though 67 percent of employees avoid a coworker after a disagreement, conflicts can have a few positive effects. HR professionals have seen better solutions (57 percent), innovations (21 percent), increased motivation (31 percent), and better team performance (40 percent) emerge from conflicts that resolve positively. It can be tough (and sometimes expensive) to learn how to manage conflicts, but once you have a grip on them, you should see a happier, less stressful, and more productive workplace in no time. Now that you’ve calmed down by reading this article, go out there and apologize if you have to!